Lieutenant Norman, who had just returned from Drury with the pay for the Mauku Forest Rifles and Militia garrison, had about £200 in his possession, mostly in bank-notes. He was shot through the chest and killed; the fatal shot was fired at such close range that his clothes were forced into the wound. When the body was searched next day the money could not be found. Its disappearance remained a mystery to Lusk for nearly fifty years. Then a half-caste member of the Ngati-Maniapoto Tribe told him that some years after the war a Maori brought him one day a bundle which proved to be a large roll of bank-notes stuck together with earth and blood. With much care the notes were separated and dried, and in the end the Maoris succeeded in passing them at the banks. This bundle, the natives said, formed part of the loot brought by Ngati-Maniapoto from the Titi fight in 1863. Without a doubt it was the missing pay for the Mauku men, and the blood which caked the notes together was Norman’s life-blood. The Maoris took a prisoner, a Portuguese named Antonio Arouge, in the employ of the Crispe family. He was captured by the cattle-shooting party and tied to a tree. After the fight he was taken into the Waikato, and remained a prisoner for some months, when he was allowed to return to the Europeans. It was, no doubt, his swarthy skin that saved him. Many stories were told of the brave conduct and accurate shooting of the Volunteers and Militia. There were also a few good shots among the natives. Just before Lusk advanced from the church stockade to Perceval’s relief he saw, through his field-glasses, a Maori marksman in a conspicuous dress taking deliberate sniping shots from the cover of a log. Although the sniper was quite 1,000 yards away he put a bullet through the soft-felt hat of Tom Harden, a Volunteer a few feet away from Lusk, and sent two or three other bullets remarkably close to him. The Maori was evidently using a captured British rifle. Lusk was a good rifle-shot, and, sighting for 1,000 yards, his first shot made the Maori sniper leap back hurriedly for cover. In the skirmish which followed as the force advanced Tom Harden had the satisfaction of taking compensation for his damaged hat by killing the native marksman. Lusk in his report gave praise to Sergeant Harry W. Hill and Private John Wheeler, of the Forest Rifles, who distinguished themselves by their determined gallantry. Another settler who behaved with special courage was Felix McGuire, afterwards a member of the House of Representatives. The Ngati-Pou and Ngati-Tamaoho Tribes, of Waikato and Patumahoe, had, it is believed, fixed a day for a general attack on the settlers. page 306 By a curious coincidence it happened to be the date on which the pakeha residents were loyally celebrating the marriage of the Prince of Wales (afterwards King Edward VII) and the Princess Alexandra of Denmark. The frontier settlers kindled bonfires at dark that night on prominent hills, and those of the Mauku, including Lusk and some neighbours, lit theirs on the Bald Hill, where it was visible for many miles around and as far as the Waikato River. The Maoris, it was said, were about to start out on their raid, anticipating the British declaration of war, but the unexpected glare of the bonfires alarmed them into the belief that their plans had been discovered, and that the fire was a signal for a general attack on the Kingites. Lusk and several fellow-settlers were returning from the bonfire hill late at night, when they met a party of about fifteen Maoris, some of them armed, who had evidently been to Lusk’s house. He demanded their business there. They replied that they had been alarmed by the bonfires and inquired if they were a signal for an attack upon the natives. Shortly after this incident Major Speedy (a retired Imperial officer), who was Resident Magistrate and Native Agent for the Mauku, Waiuku, and Pukekohe districts, was directed to read the Governor’s Proclamation to the natives requiring them either to take the oath of allegiance to the Queen and to deliver up their arms or to retire into the Kingite country, so that the Government might be able to discover who were their friends. As it was evident that the Maoris would not willingly give up their arms and leave their land, Major Speedy instructed Lieutenant Lusk to organize all the able-bodied settlers of the districts into three rifle volunteer companies, which came to be known as the Forest Rifles. Mrs. Jerram (Remuera, Auckland), a daughter of the late Major Speedy, of Mauku, says that the family’s home at “The Grange,” near the Mauku landing, was loopholed and garrisoned by the settlers for defence against the natives in 1863. This was before the stockade was built at the landing-place. Mrs. Jerram and Mrs. B. A. Crispe describe the scene in “The Grange” in the time of alarms, when for three nights the women and children of the settlement took shelter there, waiting for the cutter which was to take them to Onehunga. The armed settlers kept guard in twos; those off guard lay down on the floor in their blankets, their loaded rifles on the table. There were numerous false alarms, especially just before the dawn, the Maoris’ favourite time of attack. “The Grange” was not the best of places as a defensive shelter, for there was a thick growth of trees and creepers close up to the house, affording perfect cover for an enemy. Showing military posts and scenes of engagements, 1863. 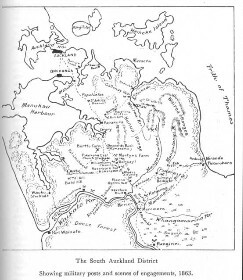 * The skirmish in Hill’s Clearing, near Patumahoe, west of Pukekohe, was fought on a level tract of country traversed by the present road from Pukekohe. The scene of the principal fighting, as nearly as can be located now, is on the right-hand side (north) of the main road from Pukekohe to Mauku and Waiuku, after passing the turn-off to Patumahoe at Union Corner, three miles from Pukekohe and the same distance from Mauku. Soon after passing Union Corner (Steinson’s) the traveller will notice on the right a very large puriri stump, forming part of the post-and-rail fence dividing the road from the fields: this stump indicates the scene of some of the skirmishing in the edge of the bush. There are still remnants of the olden puriri forest on both sides of the road. Major Von Tempsky’s MS. narrative of this skirmish is given in the Appendices.